Cal Scott was 25 years old when his father Paul, a bulldog attorney and cycling enthusiast, invited him to join him for a “recreational” cycling trip to Northern Italy that coincided with the torturous road race Le Scale (The Stairs) that climbs the slopes of Monte Grappa in the Bassano del Grappa region. Cal, a “retired” professional cyclist three years before, had been a promising and rising star for his T-Mobile cycling team in Europe. After proving to his teammates, team director, sponsors, and owner that he was not just an American import that was there to help drive interest for potential new and lucrative sponsorships, and that he could withstand the pain and suffering of the sport of cycling, Cal got an offer to become T-Mobile’s team leader. Cal became the cyclist whom other teammates would work toward helping achieve victories and earn a spot on the podium on the racing circuit. With that offer came strings attached. This is where Ross E. Goldstein’s story comes to life: as he puts the reader smack in the middle of the world of professional cycling. Mr. Goldstein uses the issues of the day—suspicion of and outright cheating by the use of performance-enhancing drugs and blood doping—to subtly expose the dark side of the sport he personally loves. The 23-year-old Cal, who is “living his dream as a professional cyclist,” is now faced with the moral dilemma that is playing out in every peloton in the race cycling circuit: Either acquiesce to the theory “everyone is doing it” and start a doping program with the blessing and guidance of the team, its doctors, sponsors, and director—or quit and face being ostracized within the racing community as a cyclist “who couldn’t handle the pain the sport burdens on every racer.” The latter being a fate far worse than getting caught doping because of the “code of honor” in which cyclists participate—meaning pain is part of the sport that defines pretenders from champions. That is the irony author Goldstein so thoughtfully intermingles with his rich storyline and descriptions of places he’s been to, stories he’s heard and people he’s familiar with in the world of cycling. Though Cal’s father has never been told why his son quit the sport he loved, the father wants to reconnect and share the sport again with his son. The trip to Italy is the way that Paul hopes to reignite Cal’s passion. In the process, Cal’s introspection and struggle is brought to the forefront not by his father but by a bicycle mechanic who helps bring clarity to Cal and his past. Therein lies another golden thread to this novel. 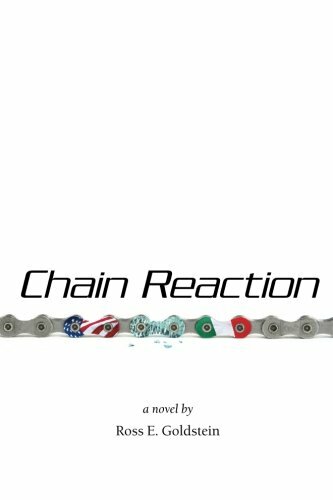 Mr. Goldstein’s intimate knowledge, his passion for the rhythm and language defining the world of cycling makes Chain Reaction more than a book about one young man’s internal struggle of coming to grips with a moral decision and its effect on his life. This page-turner takes readers with no knowledge of the sport and fills them with enough inside information to educate them, but not so much as to come off as preachy. Mr. Goldstein has obviously been around the sport a very long time. The reader comes away with the sense the author has lived in the cycling world long enough to know how the game is played. He is clever enough in his approach and smart enough to realize that readers glean that the pages of Chain Reaction probably reflect more fact than fiction—while they enjoy a great ride along the way.